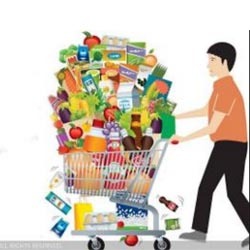 Fast Moving Consumer Goods (FMCG) denotes goods which are of quickly sold and which relatively cost less. Many FMCG items meet daily needs of every household and hence the demand remains high and on certain festivals and holidays these demand spikes! FMCG is the 4th largest sector in the Indian economy with a market size of ~US$50 billion. The sector is further expected to grow at a CAGR of 21% to reach ~$105 billion by 2020. The Government of India has also eased Foreign Direct Investment (FDI) approval to permit 51% and 100% in multi and single brand retail respectively. · Processed Foods- breakfast Cereals. · Cosmetics and Toiletries - lipstick, hair oil, creams, lotions, shampoo, bath soap, face wash.
· Over the counter drugs – i.e. Cough, cold, fever, headache. · Toffees and Sweets - chocolates, energy bars, other traditional preparations. o Ready-To-Eat - idli, dosa batter, noodles, breakfast / other items. o Fresh - Vegetables, Fruits. o Frozen - meat, ice-cream. o Baked - cakes, pastries, breads. · Household cleaning items - dish wash liquid, detergents. · Clothing - Essential clothing such as inner-ware, kerchiefs, socks. * Income levels: Depending upon their Purchasing Power Parity (PPP) the demand for buying a particular product will differ. * Culture/ Outlook: Cultural outlook of either lavish or frugal lifestyles influence demand. * Health - Products that are supposed to promote good health will have higher demand. * Peer Pressure - A consumer not buying a particular brand before will slowly start to go for it just by hearing some good things from his neighbors, friends. This creates an urge to try the product. * Fashion trends- Changing trends and styles influences specific segments significantly. * Promotional policies and advertisements: Promotional policies like gift coupons play a key role - E.g. Gift coupons given on some festive and special occasion. Also, brands endorsed by high profile personalities - like sports persons, actors will gain customer traction for eventual buy! * Vast distribution networks: Having pan-India distribution network will help to sell more. * High innovation and changes - Just to retain customers on a long term basis with better brand recall, it is important to constantly innovate and interest the customers either with unique qualities or changes in packaging designs! 10. Godrej Consumer Care Private Limited. Employment in FMCG sector requires precision, speedy execution, multitasking, innovation and good soft skills. This sector is sees constant churn in resources and organizations should be agile to recruit and retain right resources @ the right time and place! V4 Solutions - www.v4solutions.in can be your trusted partner to service all your staffing needs efficiently. We have impressive clientele across various industry verticals with sector specific deep insights which can be a great differentiator to tailor staffing solutions!